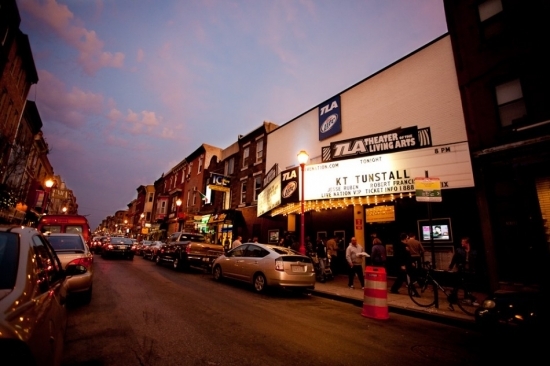 A man is dead after gunfire erupted on South Street outside the Theater of Living Arts before a hip hop concert on Friday night. It happened just after 8 p.m. on the 300 block of South Street. Fans were lined up outside the TLA waiting to head into the Lil Durk concert when a scuffle broke out near the front door. Philadelphia Police that patrol crowded South Street saw the violence and then heard the gunshots as they responded. A 25-year-old man was shot in the abdomen. He was taken to Hahnemann University Hospital where he was pronounced dead a short time later. A handgun was found nearby stashed in the wheel well of a parked car on American St. No word on if it was the gun used in the shooting. Three shell casings were recovered and one bullet struck the windshield of a tourbus parked out front. The suspected shooter was wearing a black shirt and may have fled in a limo that was later stopped by police on Columbus Blvd. Three men from that limo are being questioned. Police do not know if the shooting was related to the concert or not. No arrests have been made. Chicago-based rapper Lil Durk with Gunplay, Hypno Carlito, Money June, Chic Raw, Joey G, Los & Deniro, CONCEPTZ, and DJ Ant were scheduled to perform. The performance was canceled due to the incident. Around 100 people were inside the theater at the time and were kept there as the scene was processed. They were allowed to leave around 10 p.m.